The intrepid Meanderers continue trail-blazing their way along the coastline of the Bay of Fundy unaware of the horrors ahead. Hmm, a tad melodramatic perhaps but, hey, it’s how I felt at the time. But first let me step back to happier times. 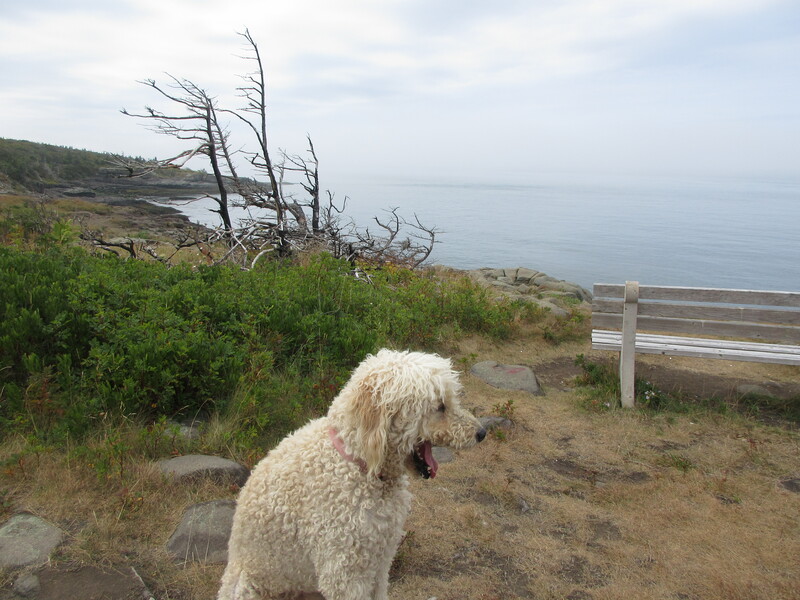 Having left the scallops of Digby behind we wind up the coast to Grand Pre, another (yawn) historic place with ocean side camping, yada yada yada. 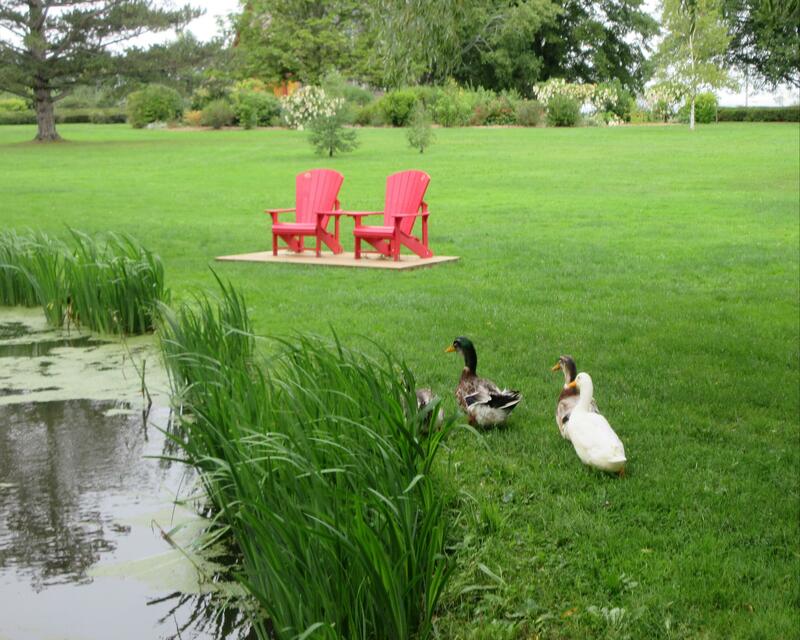 After staying at many, many sites we get a vibe, a sixth sense about whether a campground is right for us. 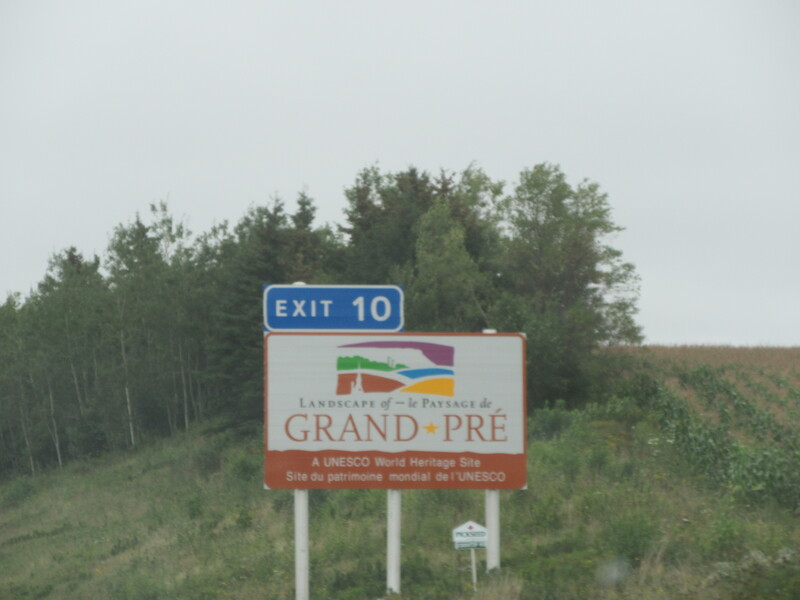 Grand Pre wasn’t. The site is crowded with year-rounders, permanent people who build porches and fences and put up hokey signs. I had visions of keg parties until midnight. Not that I haven’t participated in many a last call at the bar but I’ve got the Dude and Dog to think about. 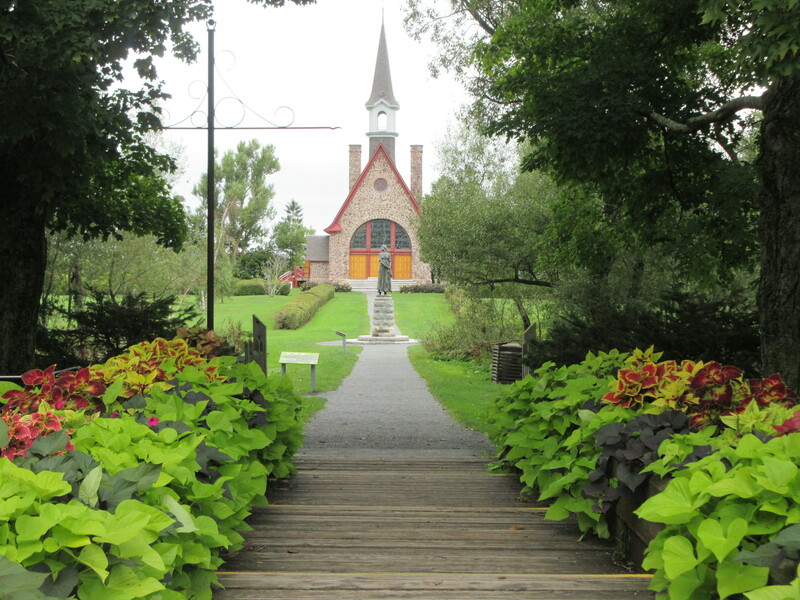 We take a quick side-trip to Grand Pre’s historic Acadian settlement, a miniature version of the Acadian village we saw previously in New Brunswick, a mini-me of history. 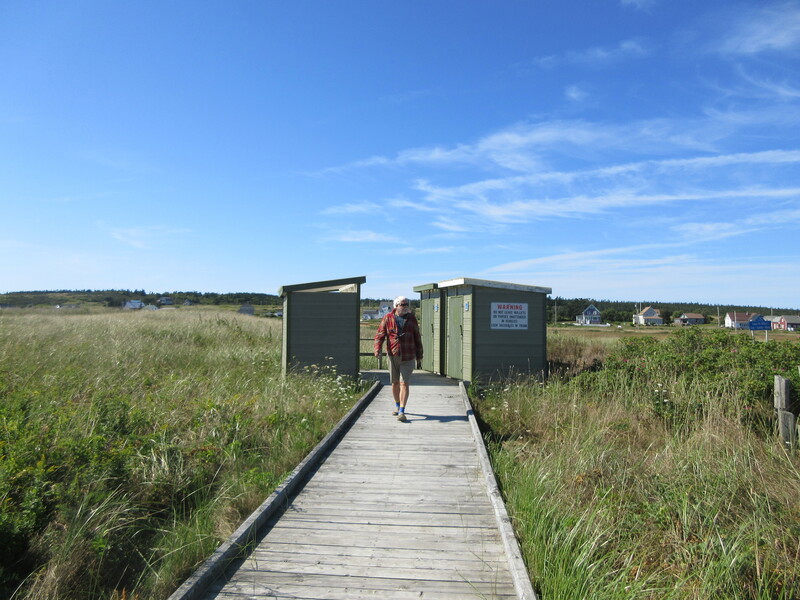 Post Labour Day weekend, the frantic tourist spots are winding down, and the best part is the half price sales have started in the gift shops. We check the Ghost inside and out and can find no hint of smoke or fire. 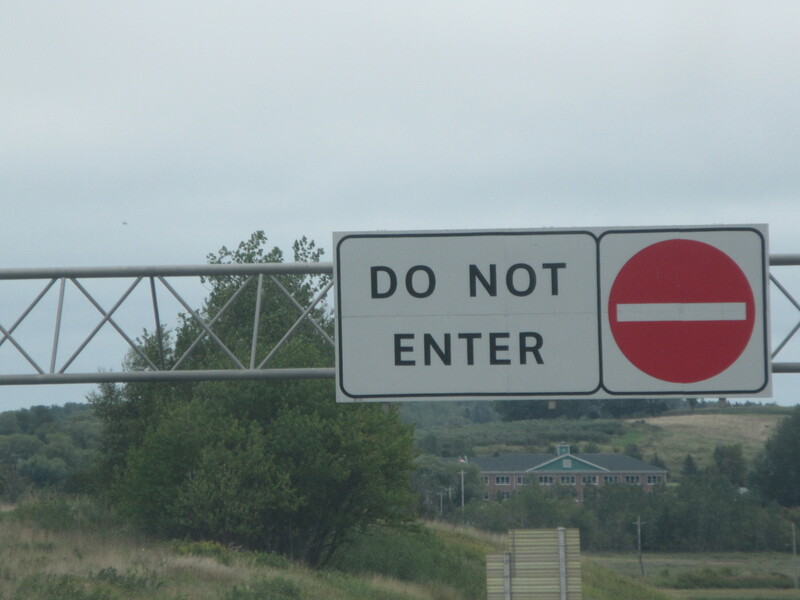 We decide to drive for a while and check everything at that point. Now GPS Gertrude always looking for efficiency has us winding up a secondary highway towards Truro, which we have determined is our new destination. The drive takes us through farm country, large swaths of land with the occasional house to break up the scenery. Not a great place to be if anything goes wrong (cue the melodramatic music). I have taken on the characteristics of the Dog, opening the window to stick my nose out and sniff the air. What I smell is not good. We pull into a church parking lot. You will recall that houses of worship are as ubiquitous as McDonald’s out here. Drive through a town with twenty houses you’ll probably find two churches. 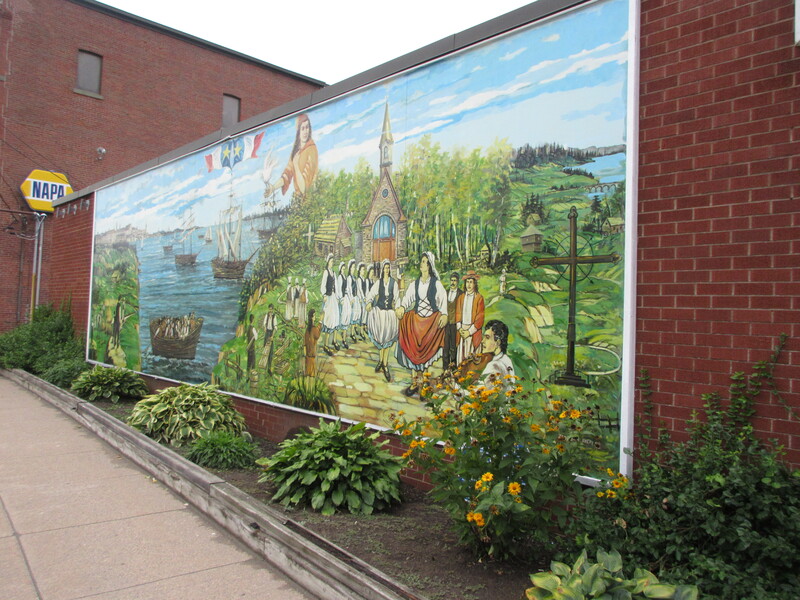 They are handy places, even for lapsed Catholics, spots to wheel the Grey Ghost around when you’ve made a wrong turn (thanks Gertrude) and make convenient stops for food, bathroom breaks and stretching. 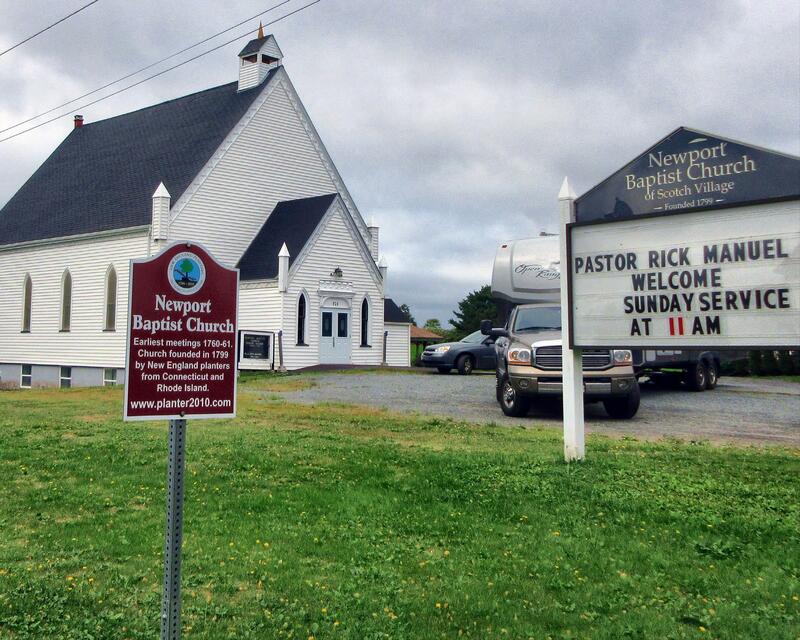 We spot Newport Baptist church, which thanks to Kevin Bacon, brings to mind a ban on dancing. Not to worry, we’re not in a dancing mood. I get on the phone to CAA but given that it’s late afternoon on Saturday the situation looks grim. Being in bum-tooty Nova Scotia doesn’t bode well for proximity to a repair shop. Cue the helpful country folk. A fifth wheel at the church is the most exciting thing that’s happened in weeks. Before we can say boiled lobster, three guys materialize from nearby houses to do what guys do best–point, discuss, ponder and point some more, all the while peppering the conversation with mechanical terms that might as well be a foreign language to the Dude, who nods gravely while fighting back tears. 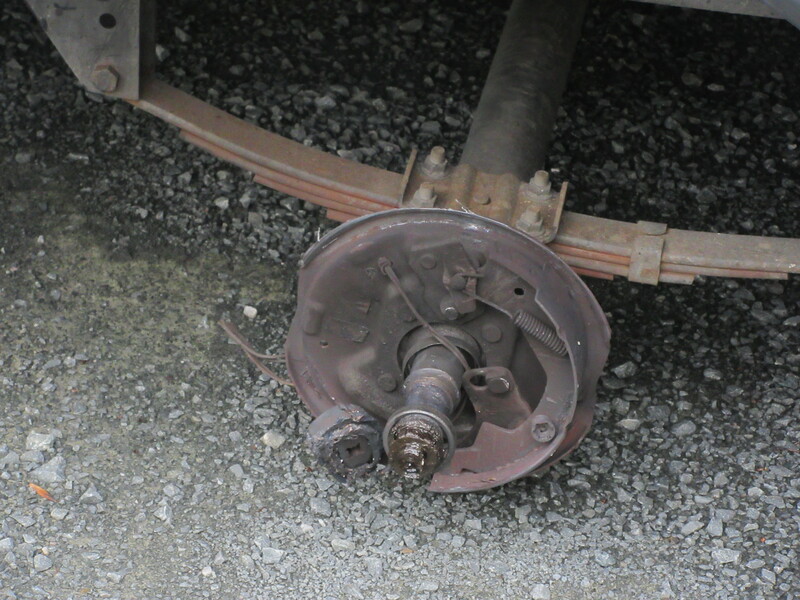 One strapping lad crawls under the trailer and advises that our wheel may have locked up, which doesn’t sound good despite his upbeat delivery. The gentlemen go back to pointing and pondering until one of them advises that a fella they know has a shop close by and proceeds to call him. In fact, they make several calls, all in vain, looking for help. The Dude’s cynical take on the human race aside, we’ve found along our travels that Canadians are kind. Perfect strangers are willing to go above and beyond to help out someone they’ve never met and will never see again. It renews my faith in mankind, with the exception of the clerk from hell in Quebec City. But I digress. Luckily a nearby campground has space. The site is essentially in the middle of a field, exposed and surrounded on all sides by the aforementioned year-rounders, but at this point we’d camp in a cow pasture. Apparently Halloween has come early. Costumed children and adults roam the campsite in what we learn is a final blow-out before people shut up their units for the winter. Given the day we’ve had it seems appropriate. Third lucky break is the RV repair shop that has left business cards at the campground. The Dude calls and books us in for Tuesday and so our relationship with Phil began. Phil’s shop is close by and he will wait by the road to guide us in as it is set back from the street. We approach from the wrong direction, miss the entrance and whiz by Phil, continuing along the narrow road until we find a church parking lot to turn around in. Phil’s full service shop at the end of a long dirt driveway looks even better to us than a church. 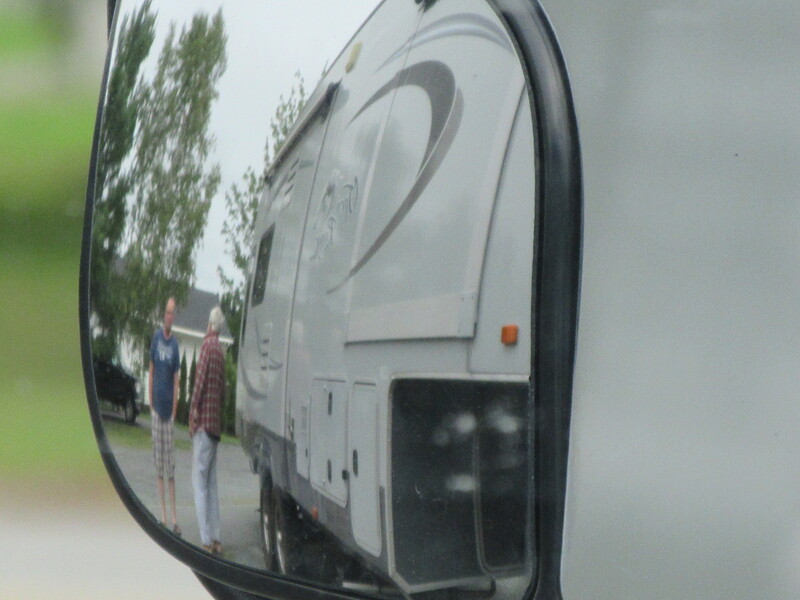 A compact chatty Nova Scotian with encyclopedic knowledge of RV repair, Phil watches us pull in before calmly advising that we are missing a wheel. The Dude and I stand in stunned silence, staring at our wheel-less axle, before the Dude mans up and accompanies Phil a quarter mile back along the driveway in search of Grey Ghost’s missing appendage. For the next two weeks The Meanderers’ journey will be spent in various hotel and motel rooms from Halifax to Truro and back to Halifax with various side trips sans trailer. The routine includes daily conversations with Phil about his efforts to find parts, have said parts shipped from Quebec, have said parts reshipped when the wrong axles arrive, have said parts welded and welded again when the first weld is measured wrong. By the end the Dude is overheard consoling Phil, who has come to regret answering that first phone call. The Grey Ghost was a challenge even for a man with a 30-year resume in RV repair. He cites manufacturer’s axles not up to the load, points out scored bearings whose scars are mute testimony to shoddy servicing and indicates worn tires that resulted from spindle nuts improperly tightened. At the end of the day, someone was looking out for us. With almost 15,000 kilometers travelled we broke down only minutes away from the one guy in the area who could help us out.